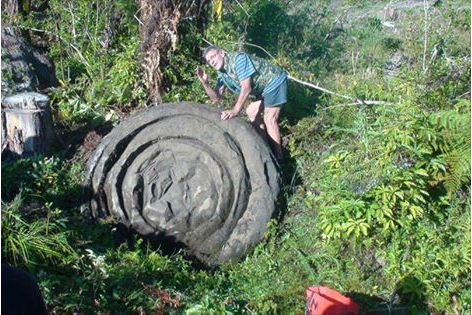 A mysterious spiral stone discovered near Waimatenui in the Tutumoe Range about 25km south-west of Kaikohe has drawn differing theories about its origins. The stone was nicknamed ‘‘Stargate’’ by Hancock Forest Management when it was found by a logging crew felling pines near the junction of the Waimatenui-Mataraua and Parker Rds late last year. The spiral stone was formed naturally, according to an archaeologist whom Hancock got to inspect it. A spokeswoman for the forest company said the theory was that as molten lava flowed from a volcano it rolled around and collected dirt or other material which had since eroded away to create the spiral. But Dargaville historian Noel Hilliam is convinced ‘‘Stargate’’ is an ancient Phoenician carving possibly 6000 or more years old which marked the winter solstice for people who populated New Zealand before Maori. The stone, facing magnetic north, is aligned with other Northland stone structures which Mr Hilliam and colleagues have investigated in their efforts to prove Chinese, Egyptian, Greek and other European voyagers came to New Zealand in the far distant past and Maori, reputed to have arrived around the 12th century, were the country’s fourth or fifth occupants. The pre-Polynesian colonisation theory is spelled out in the book To the Ends of the Earth, compiled by Mr Hilliam, Max Hill and Gary Cook, which has sold 10,000 copies since its publication a couple of years ago. Mr Hilliam said a sequel called To the Ends of the Earth and Back was expected to go on sale in mid-May. It will contain charts and other records ‘‘proving beyond a shadow of a doubt’’ the ancient voyagers and even Spanish and Portuguese ships brought people to New Zealand long before Abel Tasman and Captain James Cook ‘‘discovered’’ the country in the 17th and 18th centuries. About 6000 skeletons officially recorded as being taken from Kaipara caves for grinding into garden fertiliser at an Onehunga bone mill in the 1860s had included the remains of Turehu and Waitaha people, Mr Hilliam said. Waitaha were very tall people believed to have come from South America. Turehu were short folk which Greek ships were thought to have brought to New Zealand from Wales about 3500 years ago. The Hancock spokeswoman said the company planned to leave the rock at its site and to plant 5m away from the stumps that surround it so newly planted trees would not fall on it. People would need Hancock Forest Management permission to visit the site, she said.